A phylogenetic analysis with three molecular markers was undertaken to test the hypothesis that the complex of Psilocybe cyanescens in Europe consists of several, morphologically distinct species. The results support the existence of two molecularly well-supported morphological groups, that of Psilocybe cyanescens and P. azurescens on the one hand, and the complex of P. serbica on the other. However, in the last group, no sequence variability within the three molecular markers from P. serbica and related taxa P. bohemica, P. arcana, and P. moravica was found. It was decided, therefore, to merge these taxa into P. serbica, and to distinguish them below species level. It was also demonstrated that the secotioid Weraroa novae-zelandiae belongs to the P. cyanescens species complex. Accordingly, it was transferred to Psilocybe as P. weraroa, nomen novum. The online version of this article (doi: 10.1007/s11557-010-0684-3) contains supplementary material, which is available to authorized users. We are very grateful to Michal Tomšovský for valuable advice and to our colleagues who kindly provided their collections for study: anonymous donators, Jürgen Hechler, Egon Horak, Zdenko Tkalčec, and Ruben Walleyn (†). 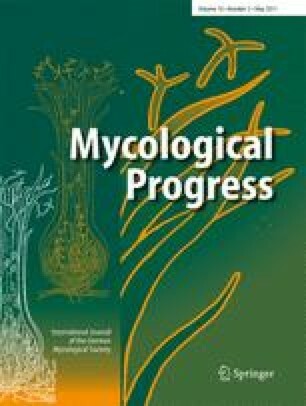 The kind assistance of curators Lenka Edrová and Jan Holec (herbarium PRM; Mycological Department, National Museum, Prague) is also greatly appreciated. This research was supported by Institutional Research Plans (IRP) AV0Z30130516 (Institute of Geology, ASCR, Prague), AV0Z10480505 (Nuclear Physics Institute, ASCR, Řež near Prague), IRP AV0Z50200510 (Institute of Microbiology, ASCR, Prague), research project of the Institute of Parasitology ASCR (Z60220518) and Ministry of Education of the Czech Republic (6007665801). An indirect support was obtained from the project IAA600480801 (The Grant Agency of the Academy of Sciences of the Czech Republic).